In anticipation of the NBA’s 2015 All Star Weekend, which is taking place in 2 weeks in New York, the NBA is going all out with its promotion. En route home in a very slushy and slippery commute, I hopped on the number 5 train in Downtown, Brooklyn, only to be greeted with images of Oklahoma City Thunder’s Kevin Durant; Kobe Bryant of the Lakers and NYC’s own Carmelo Anthony- to name a few. 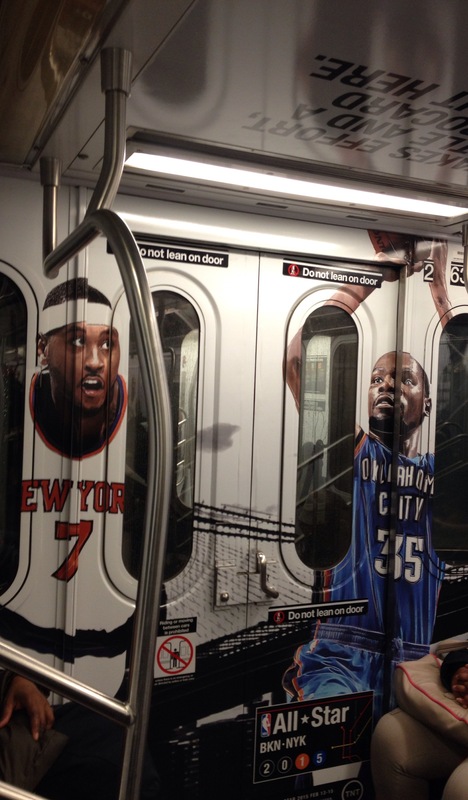 The subway car which was covered from top to bottom( seats included), with All Star Weekend promotions, were free of any graffiti or any other type of defacement. Good job, New York!! !